(Cambridge, MA) This dance was called Hiveland. It was a performance about the social psychology of approach and discovery, and it featured a group of dancers who shared a hive mind. All of the dancers constantly managed their group conduct, condoning or condemning each other, and it’s interesting how the Directors used an experimental dance to explore societal values of conformity. Those Directors were Merli V. Guerra and Kimberleigh A. Holman. Guerra is a dancer with a background in ballet and modern dance. Holman is an artist whose work gravitates to the exploration of social interaction and behavior, a theme that seemed to determine the story of Hiveland. The show’s music was composed by Christos Zevos, a Boston-based music theorist and educactor. The company dancers were Jess Chang, Devon Colton, Melenie Diarbekirian, Amy Mastrangelo, Katie McGrail, Alison McHorney, and Jennifer Roberts. Shoutout to Diarbekirian whose role in Hiveland was to deviate from the group’s hive motions and mentality. When Diarbekirian’s fellow dancers circled around making identical movements, like a flock of in-sync birds, Diarbekirian’s curious character fluttered off to offer a different gesticulation with her arm or a leg. I appreciated Diarbekirian’s role in Hiveland’s commentary on group think, and I think she did a really dynamic job of boldly being the group’s zany and innovative nonconformist. Their dance performance began with a large hexagon in the right corner of downstage, the group of dancers staring with curiosity at the honeycomb structure. One of the dancers approached the hexagon but could not touch it, so the dancer Amy Mastrangelo stepped in, introducing her part as the audacious queen bee when she brashly pranced around the hexagon with a bravado that completely captured the entire audience ‒ I both saw and felt the audience’s collective gaze glued onto Mastrangelo’s nervy chutzpah and assertive sashaying. There was absolutely no question that Mastrangelo ruled as queen bee of the hive. I was grateful for Hiveland. In groups, I don’t survive too long. In social settings, I suffer as the designated scapegoat. Groups hate me, which is not a statement of self-pity. It is an actuality that can be repeatedly corroborated by a league of my haters. In work environments coworkers collectively dislike my presence so much, that I never last at a job for more than a year. These days, I am coming to terms with these repeated expulsions and understanding why they happen: I have little interest in conformity, and that pisses off most folks ‒ in a very huge, angry way. For me and perhaps others in the audience, attending Hiveland was a chance to contemplate our unique places within groups. Much gratitude to Merli V. Guerra, Kimberleigh A. Holman, and everyone else in the Luminarium Dance Company. Please continue to bring thought-provocative dance to the Boston community. ¡Muchísimas gracias from an appreciative patron! 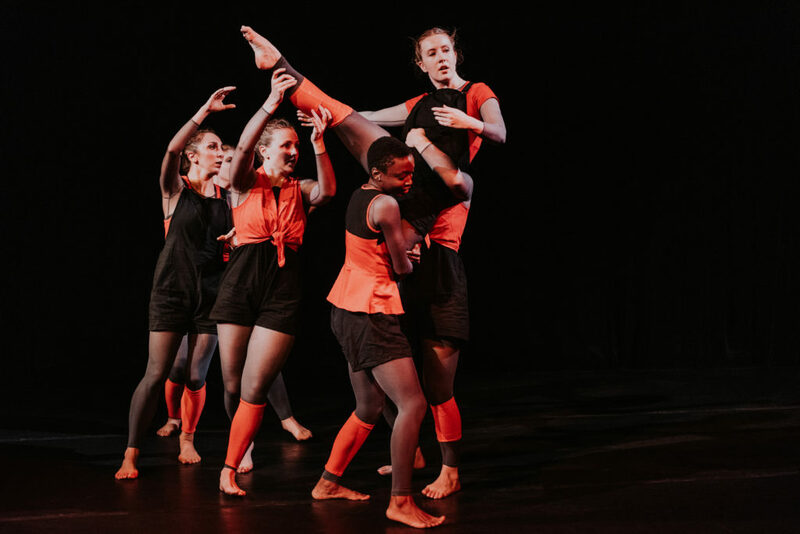 This entry was posted in Dance and tagged 2018, Alison McHorney, Amy Mastrangelo, bees, Bishop C. Knight, Cambridge, Christos Zevos, Devon Colton, Hiveland, Jennifer Roberts, Jess Chang, Katie McGrail, Kimberleigh A. Holman, MA, Melenie Diarbekirian, Merli V. Guerra, Short photo co. by Bishop C. Knight. Bookmark the permalink.